Acidosis during cardiopulmonary bypass (CPB) has been related to the strong ion difference (SID) and the composition of intravascular fluids that are administered. Less intravascular fluids tend to be administered during off- than on-pump CABG and should influence the degree of acidosis that develops. This study aimed to explore the role of CPB in the development of acidosis by comparing changes in hydrogen ion concentration ([H+]) and electrolytes in patients undergoing on- and off-pump coronary artery bypass graft (CABG) surgery. Eighty two patients had arterial blood gas measurements pre-operatively, following CABG and at approximately 0600 h the morning after surgery. 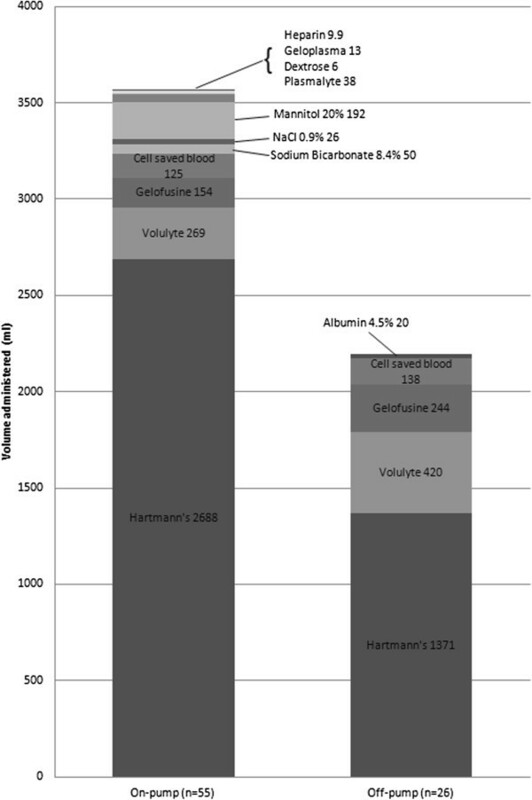 Carbon dioxide tension (PaCO2) and concentrations of sodium, potassium, chloride, [H+], bicarbonate and haemoglobin were measured and strong ion difference calculated. Data was analysed using mixed repeated-measures analysis of variance. Intra-operatively, mean SID decreased more in the on- compared to the off-pump group (4.0 mmol/L, 95% confidence interval 2.8-5.3 mmol/L, p < 0.001). Neither [H+] or PaCO2 changed significantly and there were no significant difference between the groups. By the morning following surgery, [H+] and PaCO2 had both increased (p < 0.001) and difference in SID had disappeared (p = 0.17). Despite significant differences in changes in SID, there were no differences in [H+] between patients during or after CABG surgery whether performed on- or off-pump. This may be have been the result of greater haemodilution in the on- compared to the off-pump group, compensating for change in SID by reducing the concentration of weak acids. Although it was associated with significantly greater decrease in SID, CPB was not associated with any significant increased risk of acidosis. Although originally performed without it, coronary artery bypass graft (CABG) surgery has traditionally been undertaken using cardiopulmonary bypass (CPB) since the 1970s. Since the 1990s there has been a resurgence of interest in performing CABG surgery off-pump that is without the use of CPB . The motivation for undertaking CABG surgery off-pump was that avoiding CPB might reduce haemodynamic instability and the incidences of adverse events such as stroke and myocardial injury [2, 3]. Another adverse event associated with CPB is the development of metabolic acidosis . However, the aetiology of the metabolic acidosis remains unclear. Recent work has suggested that Stewart’s quantitative acid–base approach might allows a better understanding of the causes of this acidosis [5, 6]. Conventionally, lactate accumulation secondary to hypoperfusion was thought to be the prime driver of the metabolic acidosis. However, using Stewart’s hypothesis, acidosis during CPB has been related to a decrease in strong ion difference (SID) during CPB . The normal SID is 42 mmol/L . Indeed, Hayhoe and colleagues demonstrated that the lactate concentration actually decreased during CPB . Research indicates suggested that the solutions used to prime the CPB circuit influences metabolic acidosis [7, 9, 10]. Indeed, Himpe and colleagues found that metabolic acidosis could be limited by using priming solutions that have a high SID while Alston and colleagues demonstrated that changing the priming solution from Ringer’s to Hartmann’s which increases the SID of the prime from −2 to 27 mmol/L, was associated with less metabolic acidosis [4, 11]. In addition, the administration of intravascular fluids that alter SID also affect [H+] [12–14]. Off-pump CABG surgery avoids the intravascular infusion of large volumes of fluids used to prime the CPB circuit and so should reduce acidosis compared to on-pump CABG surgery. Indeed, it has been suggested that off-pump CABG surgery is associated with a lower incidence of metabolic acidosis . Therefore, the aim of this study is to compare changes in electrolyte concentration and their influence of [H+] that occur in patients undergoing CABG surgery on- and off-pump. Ethical approval by the South East Scotland Research Ethics Committee (11/WS/0110) and management approval (2011/R/CAR/20) were granted for the study to be conducted at the Royal Infirmary of Edinburgh. Patient recruitment took place from January to May 2012. All patients scheduled to undergo isolated CABG surgery during this period were approached by researchers. Written consent was obtained from patients who wished to participate. Patients undergoing combined procedures and emergency surgery were exclusion criteria. The study design was observational and patient allocation to on-or off-pump CABG surgery was at the discretion of the surgeon. Similarly, anaesthetic technique and the choice and volume of intravascular fluids that were administered were at the discretion of the anaesthesiologist. For patients on CPB, the priming solution for the circuit was 1,800 ml of Hartmann’s, 200 ml of mannitol 20%, 50 ml of sodium bicarbonate 8.4% and 10 ml of heparin (10,000 iu). During CPB, mean arterial pressure (MAP) was maintained between 60–80 mmHg. Hypotension was corrected with boluses of metaraminol 0.5 mg if required. As part of anaesthetic and post-operative care, routine arterial blood samples were obtained by operating department practitioners in theatre and by nurses in cardiac intensive treatment unit. Measurements were retrieved retrospectively from three routinely calibrated, RapidPoint 500 blood gas analysers (Siemens, Germany). Three blood gas measurements were made on each patient. A pre-operative measurement was taken after insertion of an arterial line before induction of anaesthesia. A measurement was performed immediately after CABG and the administration of protamine for heparin reversal. A third measurement was taken the morning after surgery at approximately 0600 hours. The blood samples were analysed for concentrations of sodium, potassium, chloride, hydrogen ion, bicarbonate, haemoglobin and partial pressure of carbon dioxide. SID and base excess (BE) were calculated using the formula in Appendices I and II . Patient and surgical characteristics as well as all intravascular fluids administered during surgery were recorded. Statistical analysis was carried out using SPSS v20 (Armonk, New York, USA). Differences in patient characteristics were explored using student’s t-test. Differences in surgical characteristics were compared using Mann–Whitney U-test. Correlations between variables were explored using Pearson’s correlation coefficient. Analysis of variance (ANOVA) was the main statistical test applied for the measurements to compare the difference between the on- and off-pump group as well as difference over the three time points. The probability of post-hoc tests were corrected for multiple testing using the Bonferroni correction and a p-value of less than 5% was considered significant. A population sample size calculation was made to determine the number of patients required for each arm of the study. Previous research in this hospital showed that patients undergoing on-pump CABG surgery had a mean [H+] of 36 nmol/L with a standard deviation of 6 nmol/L . Based on this mean and standard deviation, it was initially calculated that 36 patients were needed in each group to detect an effect size of 4 nmol/L (α = 0.05, power = 0.80) which was deemed to be a clinical important change in [H+]. Due to the limited number of procedures performed, only 26 patients who underwent off-pump CABG surgery were recruited into the study. However, this shortfall in patients did not compromise the statistical power of the study. A retrospective power calculation based on the actual values obtained found that this study was able to detect a change of 4 nmol/L with a power of 0.84 (α = 0.05). Eighty-two patients were approached: one patient declined to participate. Fifty five patients underwent on-pump CABG surgery and 26 patients in the off-pump CABG surgery. Patient characteristics are similar and there were no significant differences between the groups (Table 1). Operative characteristics differed between the groups. Off-pump patients had shorter durations of surgery and stay in the critical care areas and less intravascular fluids administered (Table 2). Where BMI is body mass index. Where CPB cardiopulmonary bypass and *:significant difference from on-pump group, p < 0.05 (Mann–Whitney U-test). Mean concentrations of sodium, potassium, chloride, strong ion difference, hydrogen ion, bicarbonate, carbon dioxide tension, haemoglobin concentration are presented in Table 3. Where Na + sodium, K + potassium, Cl - chloride, SID strong ion difference, [H + ] hydrogen ion concentration, HCO 3 - bicarbonate, PaCO 2 arterial carbon dioxide tension, Hb haemoglobin concentration, CABG coronary artery bypass grafting, next-morning: morning following surgery, ‡ p < 0.05. Mixed repeated-measures ANOVA and post-hoc analysis applying the Bonferroni correction were used to analyse [H+], PaCO2 and SID. The results for these are shown and summarised in Figures 1, 2 and 3. There were no detectable differences in [H+] (F (1,79) = 1.79, p = 0.185) and PaCO2 (F (1,79) = 1.91, p = 0.171) between the groups. Both [H+] and PaCO2 showed no significant change over the course of the operation. 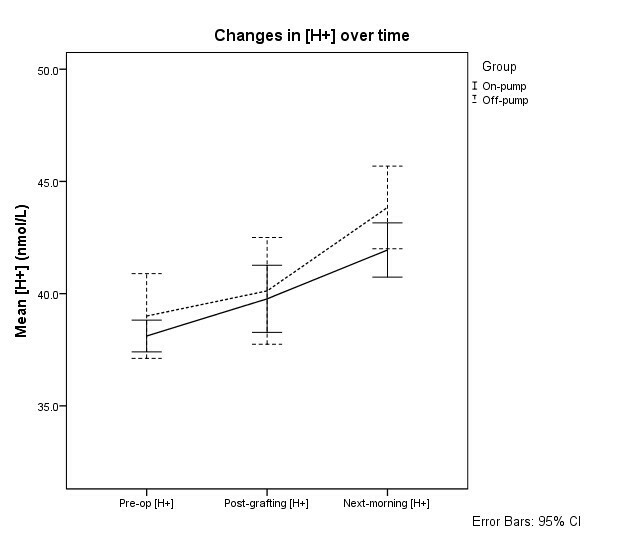 However, on the morning following surgery, [H+] was significantly higher than both pre-operative (mean difference = 4.3 nmol/L, p < 0.001) and post-CABG [H+] (mean difference = 3.0 nmol/L, p < 0.001). PaCO2 on the morning following surgery was also significantly higher than both pre-operative (mean difference = 0.45 kPa, p < 0.001) and post-CABG (mean difference = 0.68 kPa, p < 0.001) time points. Changes in hydrogen ion concentration in patients undergoing on- and off-pump coronary artery bypass grafting surgery. Mean hydrogen ion concentration [H+] and 95% confidence intervals for patients undergoing on- and off-pump patients over time. Where pre-op: pre-operatively, post-grafting: following coronary artery bypass grafting and next-morning: approximately 0600 on the morning following surgery. Changes in arterial carbon dioxide tension in patients undergoing on- and off-pump coronary artery bypass grafting surgery. Mean arterial carbon dioxide tensions (PaCO2) and 95% confidence intervals for patients undergoing on- and off-pump patients over time. Where pre-op: pre-operatively, post-grafting: following coronary artery bypass grafting and next-morning: approximately 0600 on the morning following surgery. Changes in strong ion difference in patients undergoing on- and off-pump coronary artery bypass grafting surgery. Mean concentrations of strong ion difference ([SID]) and 95% confidence intervals for patients undergoing on- and off-pump patients over time. Where pre-op: pre-operatively, post-grafting: following coronary artery bypass grafting and next-morning: approximately 0600 on the morning following surgery. There were significant differences in SID over time (F(2,158) = 185.9, p < 0.001) as well as between groups (F(1,79) = 12.46, p < 0.001). Post-hoc analysis showed that mean SID differed significantly over all time points (Table 4). Over the course of surgery, both groups experienced a decrease in SID with on-pump patients experiencing a greater decrease than off-pump patients, resulting in a significant difference at the post-CABG measurement (mean difference = 4.0 mmol/L, 95% CI 2.8-5.3 mmol/L, p < 0.001). 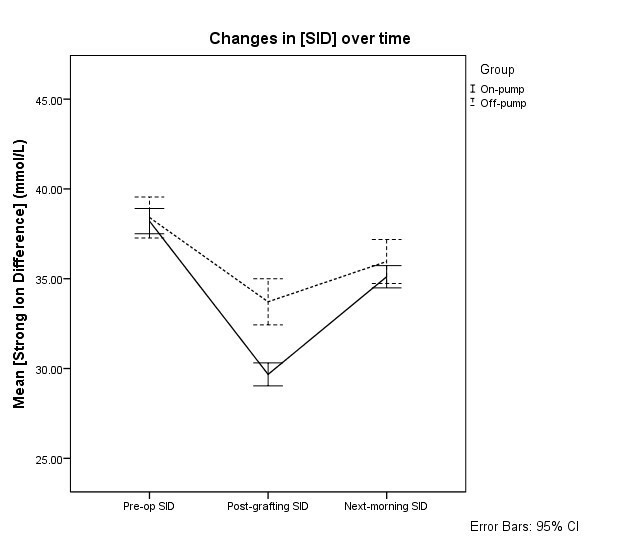 By the morning following surgery, the differences between on- and off-pump groups became non-significant and SID returned towards pre-operative values (Figure 3). Where CABG is coronary artery bypass grafting, * p < 0.001. The compositions of fluids administered to both groups were similar (Figure 4). The mean total volumes of fluid administered intravascularly during surgery was 3,570 ml (SD 739 ml) and 2,190 ml (SD 877 ml) in the patients undergoing on- and off-pump groups respectively with a mean difference of 1,380 ml (95% CI 970-1780 ml). Average composition of fluids given to patients undergoing on-pump and off-pump coronary artery bypass graft surgery. Patients whose tracheas were extubated before the measurement on the morning following surgery had a significantly higher mean PaCO2. Students t-test found that mean PaCO2 was 5.90 kPa in patients who had undergone tracheal extubation and significantly (p < 0.01) higher compared 5.40 kPa in patients whose tracheas were still intubated. 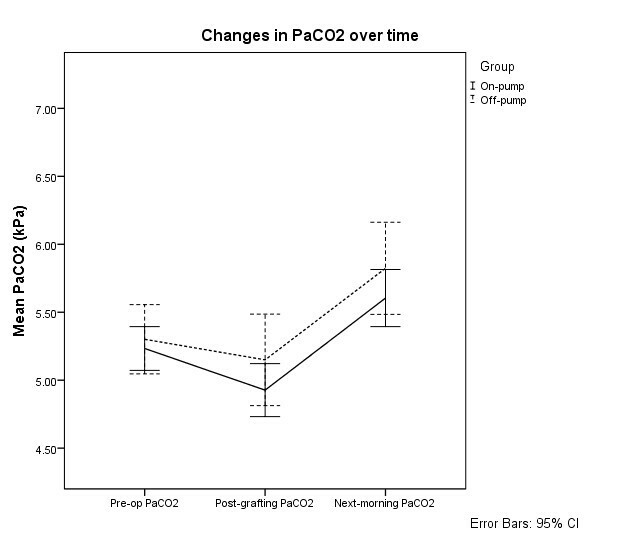 Tracheal extubation also correlated with an increase in PaCO2 (Pearson r = 0.31, p < 0.01). Univariate correlations were performed comparing changes in [H+] and SID to changes in PaCO2, Hb and SID. [H+] was found to be significantly correlated with PaCO2 (r = 0.53, p < 0.01) and SID (r = −0.35, p < 0.01). SID was significantly correlated with Hb (r = 0.48, p < 0.01). A multivariate linear regression model was then applied to assess the strength and independence of the relationships between the factors that correlated significantly with [H+]. A significant model was found using PaCO2 and SID as predictors of [H+] (adjusted r square = 0.48, F = 33.0, p < 0.001). The standardised coefficient β for PaCO2 was 0.624 and SID was −0.473 (both p < 0.001). Haemoglobin, which was used as a marker of haemodilution, was not entered into the regression model as no significant univariate correlation was found between SID and Hb. Over the course of surgery, there was a significant decrease in SID, with patients in the on-pump group demonstrating a greater decrease compared with the off-pump group. This was found to be related to the total volume of fluid administered intravascularly. According to Stewart’s hypothesis, we would expect such a significant change in SID to directly affect [H+] or for a change in PaCO2 to neutralise the change in SID. However, [H+] and PaCO2 did not change over the course of surgery. Therefore, an explanation for the lack of effect of SID on [H+] may be that the change in SID was compensated by changes in total weak acid concentration (ATOT). ATOT is mainly composed of albumin as the principal extracellular weak acid . During CPB, patients develop a dilutional hypoalbuminaemia as a result of intravascular fluid administration [10, 11, 18]. This hypoalbuminaemia induces a metabolic alkalosis, which counteracts the acidosis induced by the administration of intravascular fluids [7, 10]. To support this explanation, this study used haemoglobin concentration as a marker of haemodilution as any dilution of albumin and other blood proteins can be indirectly inferred from changes in haemoglobin . Indeed, SID was found to correlate with haemoglobin which suggests that a decrease in SID is accompanied with a corresponding haemodilution. Hence, a possible explanation for why the difference in SID between the groups did not affect [H+] is the more fluid that is administered, the more SID decreases and at the same time, ATOT is diluted. Therefore the acidifying effects of a decrease in SID may be balanced by the alkalizing effects of a dilution in ATOT. In hindsight, measuring lactate might have improved the interpretation of the results. Post-operatively, [H+] and PaCO2 significantly increased in both groups and there were no significant differences between them. In addition, changes in SID tended to resolve towards the baseline measurement and the difference in SID between on- and off-pump groups disappeared. Together these findings suggest that the majority of the change in [H+] post-operatively can be attributed to changes in PaCO2. This study demonstrates that patients undergoing off-pump surgery received less intravascular fluids and therefore, experience less severe disturbances of sodium, potassium, chloride, bicarbonate and so SID in the immediate post-CABG period compared to on-pump patients. However, these differences tend to narrow or disappear by the morning following surgery which is between 12–18 hours postoperatively. The findings of this study confirm that changes in SID are related to intravascular fluids that are administered. The findings cannot preclude the possibility that an acidosis develops by the end of surgery. However, following completion of CABG and protamine administration, there is no significant change in [H+] from baseline or between on- and off-pump groups, despite significant differences in SID. Ultimately, the changes in SID resolved relatively quickly, such that by the morning following SID is almost back to its baseline measurement. Therefore, two things can be inferred: firstly, while fluids affect SID, this may not necessarily lead on to acidosis and secondly, the use of cardiopulmonary bypass seems to have little impact on the development of acidosis. This study found that there were no significant differences in [H+] between patients undergoing on- or off-pump CABG surgery. The use of CPB is associated with more intravascular fluids and leads to a greater decrease in SID. However, this does not impact acidosis. SID normalised post-operatively and the difference between groups at the end of CPB diminished by the morning following surgery. This study was undertaken as part of a Year Four Student Selected Component at the College of Medicine and Veterinary Medicine at the University of Edinburgh. We are grateful to Dr Margaret MacDougall for her statistical advice. CSC carried out patient recruitment, data collection, performed the statistical analyses and drafted the manuscript. RK carried out patient recruitment, data collection, reviewed the statistics and the draft manuscript. RPA conceived of the study, supervised its implementation, provided statistical guidance and reviewed the manuscript. JI assisted in patient recruitment, provided advice and reviewed the statistics and the manuscript. All authors read and approved the final manuscript.